Week 1 came and PFF Greenline went 4-2-1 overall against the spread and 1-2 on over unders. 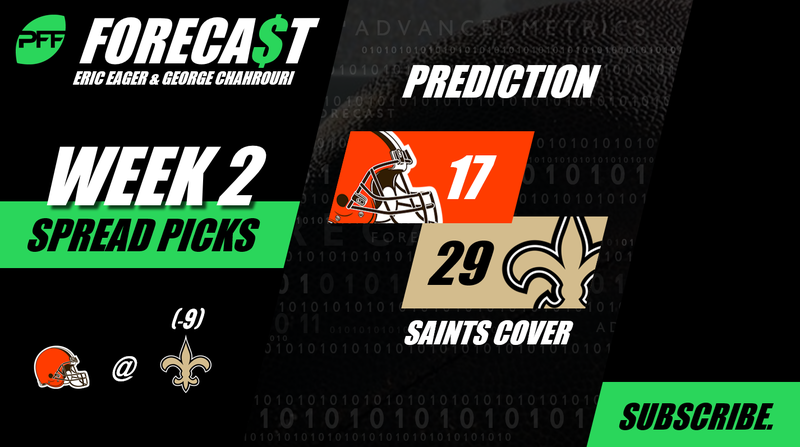 Our printed picks went 1-3-1, thanks to Pittsburgh’s inability to keep a 14 – point lead halfway through the fourth quarter in Cleveland, and the lack of anything resembling a defense in the bayou. Our way-too-early look at Week 1 went 3-2, and games that affected our win totals have gone in our direction all six times so far after the hometown Bengals won last night against the Ravens. Our models rely heavily on our PFF ELO rating system for the NFL, along with game information like where the game is played, how far a team has to travel, etc. We also fold in opponent-adjusted PFF grades into our machine learning algorithm to factor in roster changes and possible asymmetric mismatches that can occur through the course of a game. All of our picks are against the spread, but if you check out Greenline you’ll find some opportunities on totals. We are now 15-6-1 on our “Lock of the Week” picks since the start of 2017 (71.4%) and will be featured on the Sports Illustrated Gambling Show. The analyses here will involve a point-counterpoint between the two of us, using perspectives that only the PFF grades and data can provide. Follow us on Twitter at @PFF_Eric and @PFF_George, and for some podcast commentary on some of these picks, and the process that goes into them, give the PFF Forecast a listen. Point (Eric Eager): New Orleans’ defense looked terrible in Week 1, but most of that damage was done on the outside and came as a result of Ryan Fitzpatrick throwing every single ounce of caution to the wind. Tyrod Taylor, with his 33rd-biggest big-time throw rate and his second-smallest turnover-worthy play rate, does not have those cards in his deck. Patrick Robinson (only 10 yards allowed in coverage Week 1) should be able to handle Jarvis Landry, while Cameron Jordan, Alex Okafor and rookie Marcus Davenport should have some success against a Browns offensive line with an undrafted rookie left tackle. Oh yeah, and Drew Brees. Counterpoint (George Chahrouri): Aside from Baker Mayfield taking the field, the only real issue would seem to be that Brees is eaten alive by Myles Garrett who earned the ninth-best pass-rush grade by an edge rusher in Week 1. Given that Terron Armstead is dealing with a knee injury, this is certainly not a trivial situation. Many might say that the Saints corners are the players most likely to put this cover in jeopardy but the preponderance of their work would tell you that Marshon Lattimore (eighth-best coverage grade in 2017) Ken Crawley (25th) and Robinson (fifth) are more of a strength than a weakness. The quarterback most likely to repeat what Fitzpatrick did is going to be on Hue’s bench to start, but the House of the Rising Sun has been known to cause a sudden change of heart. For further discussion on the spread picks and much more, listen to the PFF Forecast and send questions for @PFF_EricEager and @PFF_George to answer on the podcast by submitting a review on iTunes.